Yorkshire pudding is a batter pudding usually eaten with roast beef. 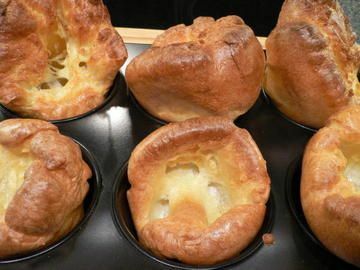 In Yorkshire it was traditionally served in large slabs with gravy before the beef itself - the idea being that the stodgy pudding would fill up empty stomachs if poverty made the main course meagre. It can be made either as one large pudding, or as individual muffin sized puddings (my preference). Mix ingredients and whisk. Leave to stand for 30 minutes. Heat oven to Gas Mark 7 (425 deg). Brush muffin tins with oil and heat. Half fill muffin tins with batter. Bake for 20 to 30 minutes until risen and golden. If you want one large pudding, bake in an 8 x 11 inch roasting tin or 9 inch square cake tin for about 30 to 35 minutes. Oh how I love Yorkshire pudding! My late aunt used to make it quite often. I have wanted a recipe for a long time. Thank you!